Photograph by D. K. Hall. Snow in Colorado - February 2000. The highly-reflective nature of snow combined with its large surface coverage (snow can cover more than 40% of the Earth's land surface during the Northern Hemisphere winter), make snow an important component of the Earth's radiation balance. Snow on the ground influences biological, chemical, and geological process. Many areas of the world rely on the snowmelt for irrigation and drinking water. It is necessary to monitor snowpacks closely throughout the winter and spring for assessment of water supply and flooding potential. Snow is precipitation that forms from water vapor in the atmosphere where temperatures are below 0°C. Snow may fall in the form of single crystals, or as an amalgamation of several crystals. 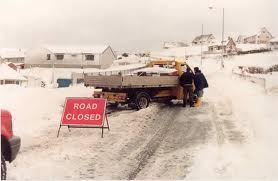 Snow may melt on its descent and turn into rain, or it may be deposited on the ground as snow cover. Successive snowfall may build up and form a snowpack. After snow is deposited, the particle shapes are modified by metamorphism. Dendritic ice crystals decompose into fragments; the larger fragments grow at the expense of the other ones. Over time, the particles become more rounded. If there is a temperature gradient in the snowpack, larger snow grains may form near the bottom of the snowpack especially if the snow remains on the ground for very long. Large grains at the base of a snowpack are called depth hoar. Albedo is the ratio of the reflected to the incoming solar radiation. The albedo of snow can be 80% or more for a freshly-fallen snow cover and may drop below 40% if the snow surface becomes weathered or dirty. 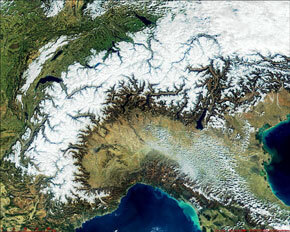 Snow in Alps - March 5, 2000. Satellites are well suited to the measurement of snow cover because the high albedo of snow presents a good contrast with most other natural surfaces except clouds. Because of this characteristic, snow was observed in the first image obtained from the TIROS-1 (Television and Infrared Observation Satellite) following its April 1960 launch (Singer and Popham, 1963). In the mid-1960s, snow was successfully mapped from space on a weekly basis following the launch of the Environmental Science Service Administration (ESSA-3) satellite which carried the Advanced Vidicon Camera System (AVCS) that operated in the spectral range of 0.5 - 0.75 µm with a spatial resolution at nadir of 3.7 km. The National Oceanic and Atmospheric Administration (NOAA) has measured snow cover on a weekly basis in the Northern Hemisphere since 1966 using a variety of sensors, including the Scanning Radiometer (SR), Very High Resolution Radiometer (VHRR) and the Advanced Very High Resolution Radiometer (AVHRR) (Matson et al., 1986). The current NOAA product is a daily snow-cover product (Ramsay, 1998). Since 2000, MODIS has produced daily snow-cover maps (Hall et al., 2002; Riggs et al., 2006; Hall and Riggs, 2007). Sea ice off the east coast of Baffin Island, Canada. 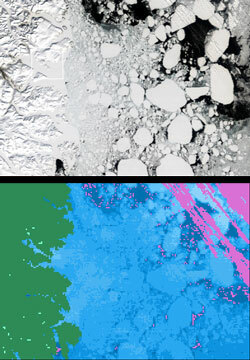 MODIS reflectance image (top) and MODIS sea ice product (bottom) from May 5, 2001. Sea ice forms from the freezing of sea water. Sea ice covers roughly 7% of the Earth's oceans and may attain a thickness of 3 m or more. Movement of sea ice causes deformation of the ice pack. The presence of sea ice influences the temperature and circulation patterns of both the atmosphere and ocean. Sea ice reduces the amount of solar radiation absorbed at the ocean's surface, restricting exchanges of heat, mass, momentum and chemical constituents between the atmosphere and the ocean. With an ice cover, only 30-50% of the incident solar radiation is absorbed, the rest being reflected, while without the ice 85-95% is absorbed by the oceans (Washington and Parkinson, 1986). The smooth and thin new sea ice is metamorphosed by temperature fluctuations, compressive and shear forces, surface currents and wind as it ages. In addition, as winter progresses, the ice thickens and snow falls on top of it. Ridge formation and surface roughness increases with age, and the angular edges and the smooth surfaces of first-year ice floes are transformed into rounded edges with hummocky-ridged surfaces that are characteristic of multi-year ice, or ice that has survived a summer's melt and is more than one year old. Another important process that occurs as sea ice ages is desalinization. Sea water contains 30-35 parts per thousand salt. Brine drains out or is flushed out of the ice as the water freezes and the ice ages. If sea ice could be frozen extremely slowly, pure ice would result because of rejection of all salts during the freezing process. However, the freezing rate is normally too rapid to allow pure ice to form, so brine is trapped in the lattice structure of ice (Pounder, 1965). Both meltwater percolation and gravity expedite brine drainage. Typical sea ice salinities are 10-15 parts per thousand for newly-formed sea ice, 5-8 parts per thousand for 1-2 m thick first-year ice, or ice that is less than one year old, and 0.1-3.0 parts per thousand for mutiyear sea ice (Weeks, 1981). Satellite remote sensing is a useful tool for mapping sea ice concentration globally. A global year-round record of ice-covered Antarctic and Arctic seas was acquired from the Electrically Scanning Multichannel Microwave Radiometer (ESMR) on Nimbus-5 (Zwally et al., 1983). Global maps of sea ice extent and concentration have been produced. The ability of passive-microwave instruments to collect data through cloud cover and polar darkness makes them well suited for global monitoring of sea ice. However, microwave instruments do not collect data on albedo or temperature (Comiso, 2006; Hall et al., 2004) of sea ice. Which is important during the spring-summer-autumn seasons with repect to the energy exchange of sea ice. Measurement of sea ice albedo and temperature are possible with optical sensors such as the AVHRR, Landsat Thematic Mapper (TM) and Enhanced Thematic Mapper Plus (Lindsay and Rothrock, 1993; Key and Haefliger, 1992 and Key and Collins, 1997), ETM+, and MODIS (Riggs et al., 1999). Daily sea ice extent and ice-surface temperature (IST) maps have been produced by MODIS since 2000 (Riggs et al., 1999; Hall et al., 2004) using the IST algorithm by Key and Haefliger (1992). While every effort has been made to place a complete data set on the Web, some days may be missing.